There are two important diabetes device manufacturers in Finland. Mendor's Discreet glucose meter offers everything you need to measure your blood glucose in a single package. It makes measuring blood glucose really fast, and also discreet. Modz have a glucose meter that sends the measurement results directly to the cloud service and routes it to a cell phone in another location if requested, so parents of children with diabetes can monitor the treatment of their children, for instance. It's also highly motivational, and they have their Moodz characters - and also Angry Birds themes! 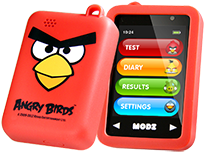 You can get the Modz meter with the Angry Birds look! Of course, both of the device manufacturers also develop their own software solutions to analyze the measurement results. But there are limits to how many things a startup company can really focus on. There are other companies concentrating on software and services. Both MyHealthWay and Quattrofolia are warming up the WellMate concept developed in Nokia in early 1990's. Both are building their offerings as turn-key standalone solutions, and targeting other chronic illnesses as well. Quattrofolia are being bold enough to even start their own clinic. Then there is the brand new Femma5. They don't even have a website up yet, but they have a grand vision for algorithms for artificial pancreas systems. What does this all mean for Sensotrend? I personally really appreciate the work Mendor has put into product development, and also for integrating other blood glucose meters into their Balance software. We've worked together with them to get the data flowing between Balance and Taltioni, and like to continue cooperating even further. Currently their Balance software only analyzes blood glucose measurements. We're trying to help them see that that information does not really include everything you need to know to manage your treatment parameters. Factors like nutrition, exercise, and insulin dosages need to be factored in. Modz complements Sensotrend's offering beautifully. We get a lot of wishes for our solution to be real time, allowing parents to check on their kids while they are away. Most currently available glucose meters don't offer that kind of automatic real-time sharing of measurement results, and Modz certainly fulfills a real need there. With them, we're discussing combining our efforts in service development. We seem to share a common vision. I like the way MyHealthWay manages the communication between people with diabetes and their healthcare professionals. And their mobile apps look quite nice, I'd like to use them as part of Sensotrend's service, for manual data entry when that is needed. They haven't yet warmed to my proposals of cooperation. They also don't see the value of automated data import, rather feel it is important that people with diabetes interact with their app as often as possible, claiming it empowers the patient. I myself tend to disagree with that sentiment. For me, data entry needs to be as automated and easy as possible. I want to be empowered by data just being there for me to analyze it when I want to, not having to manually copy each entry from a device to another. I edited the above based on Jarl's comment "Our roadmaps cover the automatic input part as well but the point here is to start off with the manual input to activate the user and become empowered in his/her care process and see beyond the figures and data in order to see the big picture." Please see the full comment in comments section. Quattrofolia have interesting studies and knowledge around HbA1c values, how those can be calculated from measurement results and how that benefits people with diabetes. For me, some of that thinking seems kind of twisted. I mainly appreciate HbA1c as an easy and cheap metric available when there are no reliable glucose measurements. But when there are measurements available, they offer much more information, and HbA1c should just be used as a verification method to spot possible systematic errors. What I really like about Quattrofolia, though, are their plans for the evolution of their service, into a kind of a Diabetes University, providing high quality guidance for people with diabetes. Finally, I hope the data gathered with Sensotrend's own solution will ultimately help Femma5 in their development work. At some point, they need to know how different kinds of exercise affect different people, and in general how differently we all react to all the factors affecting blood glucose values. Just combining the products and services of all these Finnish diabetes startups into a single offering would be a big step towards that often discussed Dream Device. If we can agree to work together to get the basics in place, we'll get to take the next steps much sooner! This is my second entry to the Diabetes Blog Week. The selected theme for today was poetry, but with everything going on with our Startup Sauna program, end user interviews, and closing the financing round I wasn't able to connect with the poet within, and decided to play the wildcard 'Diabetes Dream Device' instead, and continue with yesterday's theme. Thanks for the comment, I updated the post. Better now?